I recently bought this cookbook online. I quite like it. I love that it is almost 50 years old. 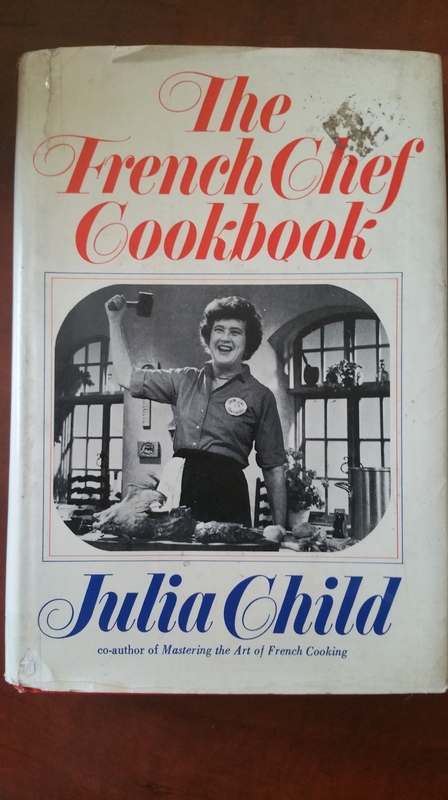 It has a history and somehow I am sentimental about books that are used, especially cookbooks. Somebody used that book and hoped to prepare something great for somebody else. I especially like this one because it has the menus Julia prepared on each episode of her show. I love that because the recipes are so diverse in. Well, I saw this recipe for chicken and thought it was unusual. I had never tried frying a whole stuffed chicken then roasting it! The result was, as you would expect. Wonderful. I had a bit of difficulty flipping the chicken over when I fried it but it does not matter. This recipe involves steps and takes a bit of time.But you know, all good things take time and this is definitely worth it! Sprinkle salt and tarragon in the cavity of the chicken and stuff with the vegetables along with one tablespoon of the butter. Tie the chicken legs together well in oorder to seal the cavity well. 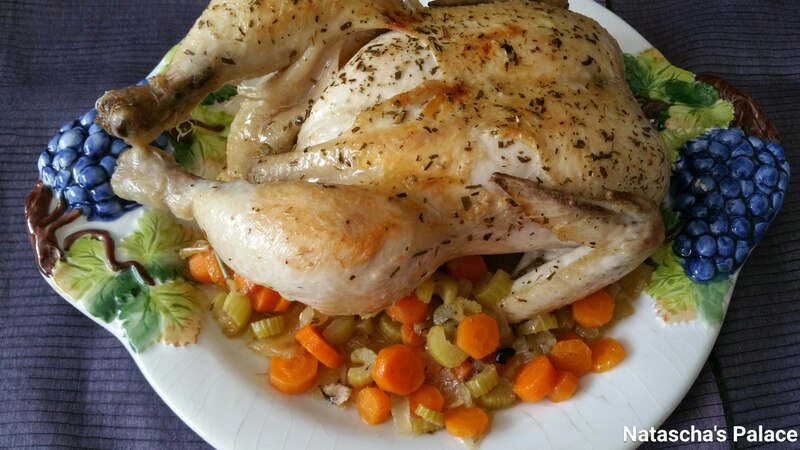 Dry the chicken well and massage it with the reamining tablespoon of butter. Coat the skillet with a thin layer of olive oil over medium high heat. The oil should be smoking a bit! Carefully place the chicken, breast facing down, and brown for a minute or two. Turn the chicken on its side and Brown. Continue turning until all the sides are golden. This part is a bit tricky and you will need some good strong wooden spoons. If you break the skin a bit while turnbing, don´t worry. So did I. While it is browning, cook the vegetables. Add 2 tablespoons of butter to the casseroleand melt over moderate heat. Stir in the vegetables and giblets. Cover and cook slowly until the vegetables are tender. 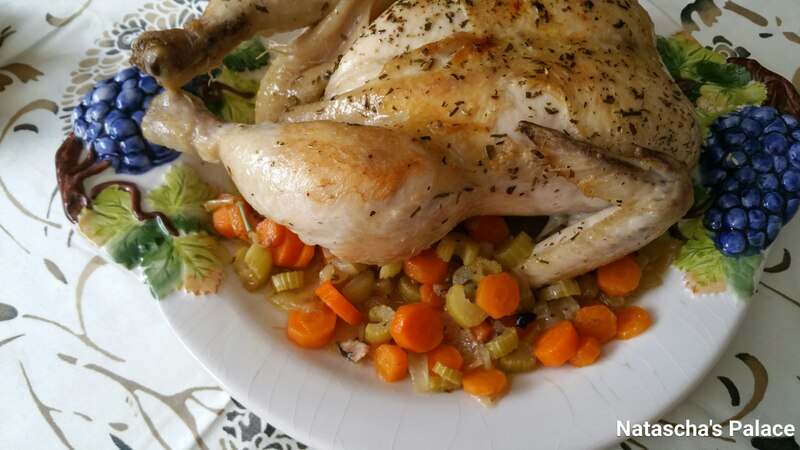 When the chicken is fully browned, spread the vegetables to the sides of the casserole and put the chicken in, breast facing up. Spread the remaining tablespoon of butter over the chicken and sprinkle with salt. Sprinkle the vegetables and giblets with tarragon. Put a large piece of foil over the chicken and place the cover on the casserole. Julia says that it shout be done in an hour and 20 or 30 minutes. Mine took an hour. The smell in the house was incredible. Remove the chicken from the casserole and palace on a serving plate. Remove vegetables and skim off any fat from the juices. You can add a 1/4 cup of sherry or port to the juices and boil for several minutes until it becomes syrupy. Pour the juices over the chicken when serving oy serve the juices in a gravy bowl.